Scott's Web Log: Whatever Became of Stem Cells? Whatever Became of Stem Cells? Although I had planned to let it slip by without caving into the frenzy, I felt some sense that I should at least acknowledge the news from last week that scientists at a Toronto hospital reported that they now have proof the body's nervous system helps trigger type 1 diabetes, thus opening the door to potential new ways to cure the disease. My reasoning has more to do with having some historical documentation on my blog rather than overwhelming excitement over the announcement itself. While promising, as I've said many times before, if I were a mouse, I'd have a choice of maybe a dozen different "cures," but so far, not one of these miracle treatments has translated into success in humans, so while there is reason to be optimistic, I've learned to contain my excitement until we see proof in humans. I'm taking a wait-and-see approach. I feel very much the same way about stem cell research. The field is divided mainly by the type of cells used; research using embryonic stem cells is the most contoversial since it involves the destruction of a blastocyst which, if implanted into a human uterus, has potential to become life. These are routinely discarded as medical waste without any threat of criminal prosecution under current U.S. law. (It seems inconsistent to ban medical research on all but a few cell lines created before August 9, 2001, yet simultaneously permit thousands to be tossed into the trash.) Anyway, this branch of science holds tremendous potential for a wide range of diseases, including type 1 diabetes, but in recent years, the field has been stifled by political arguments that have little to do with the actual science. This month, however, there were several positive developments. As I wrote back in 2004, when California voters passed proposition 71, "Regardless of what happens on a Federal level, the passing of Proposition 71 has ensured that progress will be made in California and very possibly other states which follow suit. This state roposition may be the critical junction that leads researchers forward on the road to a cure." Today, The Boston Globe reported that New Jersey Governor Jon S. Corzine announced $7 million in grant money for construction of facilities for embryonic stem-cell research and $3 million for adult stem-cell research grants. Last week, state lawmakers approved $270 million to build stem-cell research centers -- double what the state spent last year. "Corzine has, quite literally, redoubled our efforts to encourage the best and brightest minds in the state to pursue stem-cell research," said N.J. Assemblyman Neil Cohen, sponsor of the 2004 law legalizing embryonic and adult stem-cell research in New Jersey. At the present time, California, New Jersey, Illinois and Connecticut fund stem cell research, and it seems likely that Massachusetts may join them after newly-elected Democratic Governor Deval Patrick takes office. 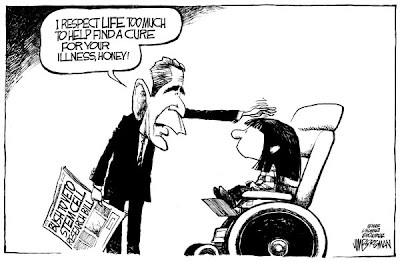 Although dLife rated the President, Senate, and Congress the second-biggest disappointment of 2006 "for their handling of stem cell research and the art of arguing the argument and not looking for viable solutions," Democrats have vowed to revisit the stem cell issue in Congress next year. But with a President unwilling to negotiate, they may have difficulty in accomplishing much on the issue. While progress will be made in U.S. states that are supporting this research, the big news on this topic is coming from across the Pacific. No, not South Korea, but Australia. In early December, the Australian press reported that the Australian Parliament had passed legislation overturning a ban on therapeutic cloning, paving the way for scientists to pursue the field of regenerative medicine in that country. One of the first targets for embryonic stem cell research in Australia will likely be a cure for type 1 diabetes, with a top Australian researcher predicting major progress within four years. "Type 1 diabetes is the first port of call for us. Once we have the cells in the petri dish, we can see what regulates the disease, how we can understand the disease process and how we can go through drug discovery. We can do it in the petri dish, rather than in human or animal tests," according to Dr. Kuldip Sidhu, who is the diabetes transplant unit manager for Prince of Wales Hospital. Professor Peter Schofield, a neuroscientist who was on the Lockhart committee which recommended that therapeutic cloning be adopted, said diseases and illnesses that have a focal cause would be the first to see results. "Any disease that has a focal cause would be looked at first. For example Parkinsons' disease, where it is one small region of the brain that undergoes degeneration; diabetes, where you have the immune attack on the pancreatic beta cells; and spinal injury, where there is a lesion you're trying to get neurons to grow over," he said. Australia joins several other countries, including the UK, Singapore, Israel and Sweden who all have what can be considered "hospitable" environments for stem cell researchers. Last year, opponents were predicting that the field would suffer irreparable damage when it was revealed that South Korean cloning scientist Hwang Woo-Suk committed science fraud regarding progress made on embryonic stem cell research. However, with Australia's support, along with funding from several U.S. states who are contributing to the field, perhaps 2007 will be the year this field of research finally starts making some legitimate advances! I too have been hesitant in my excitement for the recent findings in Canada. I am optimistic that good will come from it, and I feel that it is good to see this type of thing coming from a different direction (neurological rather than auto-immune). The international stem cell research sounds promising, and I hope for all our sakes that progress will be made. Maybe even in our lifetime. Any advances in this new way of preventing T1DM(Type 1 Diabetes) will not have much of an impact on those of us(many) who already have had the "Destruction to our Beta Cells" take place by our Immune System. We still remain dependent on exogenous insulin and the complications of this complex disease on our bodies still exist despite "good control of blood sugars". I think "guarded optimism" is the way I would describe my feelings on all of these potential cures. As multinational companies have learned, they rely on earnings from around the world, thus avoiding putting "all their eggs in one basket" by reliance on the U.S. alone, and I think some diabetes organizations get this, too. JDRF and the DRI are two such organizations that exemplify this very well. As I noted in my post on the recent DRI's Sixth Annual Research Update ("Roadmap to a Cure") in NYC, the consensus seems to be that any cure for T1DM will require two separate treatments, one to address the issue of autoimmunity, and the other to restore beta cell mass in order to attain insulin independence. There may be several ways to accomplish either or both of these things. The Canadian finding may open one way of addressing the issue of recurring autoimmunity -- only time will tell.